Start with the seeds. Loaded with magnesium, zinc, protein, amino acids, antioxidants and omega 3s, pumpkin seeds are nutritional powerhouses wrapped in tiny packages. Just spread them on a baking sheet and toast at 300 degrees for about a half hour. Make broth. Boil the stringy, slimy stuff from the center in water to make broth for soup. Try adding carrot, celery and other vegetable trimmings for more flavor. Make Pie or Pumpkin Butter. So this is the part where you might consider buying a smaller “pie” pumpkin, as the larger carving pumpkins are bred for looks, not taste. This way you could have a pumpkin that serves two purposes — a tiny jack-o-lantern and a nutritious, delicious dessert. Just don’t carve it until Halloween and puree up the flesh the next day, to make sure it’s fresh. If you don’t want to eat it yourself, pumpkin makes a great snack for wildlife, says the National Wildlife Federation. Birds and other small mammals will be delighted to find the seeds scattered in your yard. Don’t salt or season them, NWF warns. 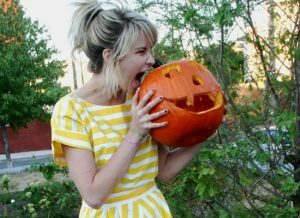 Many backyard wild animals will eat pumpkin flesh if you cut it up into pieces for them. Porcupines will eat it whole. 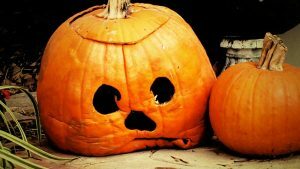 If your pumpkin’s been carved for a few days and it’s starting to rot, composting is a far better option than the dump. Pumpkins are great additions to a compost pile. They’re are 90% water, which means they breakdown quickly. Here’s how to do it. Composting reduces or eliminates the methane released into the atmosphere when organic matter decomposes in landfills. Beautiful roasted: Make Pumpkin and vegetable soup using a bone broth as a base – great for winter and freezes well: Use as a second vegetable – boiled, baked or whatever ……. an extremely versatile, sweet, tasty vegetable and grossly underrated in European societies. I would only put the pumpkin pie ones out plain for decoration with other things, corn stalks, mum plant or by them selves. I buy the deco ones for cutting. and always compost it when it starts to go. If you cut a pie pumpkin or one you plan to eat be wary of the candles you put in it-you will eat toxic chems in the candle, especially if it is conventional candle and scented. scents in ANYTHING are unregulated, they can and do put whatever they want to get the scent desired, even carcinogens. (they go through your skin by the way.) Unless you have poor wild animals that will eat it, compost it. If the seeds have all those nutrients…I am thinking I would like the pumpkin with them in my compost pile. better if via my other kids, the furry ones. Feeding wildlife – particularly those who are considered “nuisances” by many people can lead to a lot of issues in communities and ecosystems. Please don’t feed the animals. Learn more at TheFurBearers.com. I use pottery pumpkins for candle lit pumpkins and just draw faces with a black sharpie on many, many, small pie pumpkins. Then November 1, I bake them and puree the flesh and freeze it in 2 cup batches to use all year in tacos, soups, and pies. My question would be how safe is it to eat after sitting outside in a variety of temperatures for a month? The seeds, yes because you’d get them right off but the pumpkin itself – feed the wildlife or compost. You know the quick, easy way remove toxins from the soil? You grow pumpkins. So unless they’re organic, I won’t eat nor compost them. Deer can have them, I just won’t feed them to my family. Larger jack-o-lantern pumpkins can be delicious! Slice the flesh, brush with olive oil, sprinkle with herbs, and grill or roast. Grate it and make muffins or loaves. Purée it into soup. Add cubed pumpkin to stews and curries. Freeze the purée in ice cube trays as baby food. Roast the seeds, of course. Every September and October, I buy several of these big, bad, boys, usually for less than three bucks apiece, and feast like a king. I think these are all amazing ideas. The one I’m more drawn to is the edible version. If we happen to carve them a few days before and set them out, would they still be safe to eat? My dogs love cooked pumpkin, too. And it’s very healthy for them, too. You can also donate pumpkins to your local animal sanctuary! Pigs, cows, sheep, goats, chickens, horses and other rescued animals love eating pumpkins! It gives these rescued animals a special treat that is also nutritious. It also helps the sanctuaries supplement their feed bill. Curried pumpkin or squash,as a vegetable or soup is great. I always roast and then puree my pumpkin–that we don’t carve, just set out for decoration–and then freeze it in 2-cup portions for pumpkin bread (composting the rest). I never thought of broth! Going to make that this season–thanks! There’s probably a local farmer who would gladly take it to feed his pigs or chickens. Pie pumpkins are cut in half and partially baked, fill with cubed bread, gruyere cheese and your choice of herbs. Add edible flowers for color and flavor.